Photo by Georgia O’Keeffe (American 1887-1986). 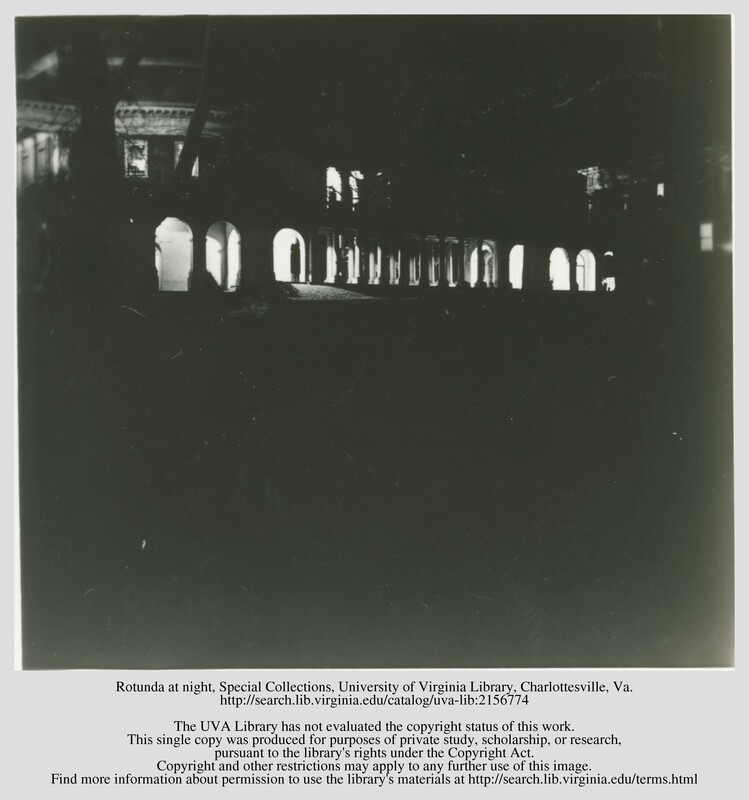 Untitled (Rotunda -University of Virginia), Scrapbook of UVA, 1912-1914. Watercolor on paper. Georgia O’Keeffe Museum. Gift of The Georgia O’Keeffe Foundation (2006.05.608). © 2018 Georgia O’Keeffe Museum. In these classrooms, O’Keeffe first encountered the philosophy of Arthur Wesley Dow, an artist and teacher who would become one of her most influential mentors and shape her now-famous abstract style. And it was in the Blue Ridge Mountains where O’Keeffe, like thousands before and after her, found inspiration, restoration and the courage to keep pursuing her dreams, even when they felt far out of reach. A new exhibition opening this weekend at UVA’s Fralin Museum of Art, “Unexpected O’Keeffe: The Virginia Watercolors and Later Paintings,” chronicles these pivotal years of O’Keeffe’s life, long before she became a name still known around the world today. The exhibition opens Friday and will run through Jan. 27. Visitors will find watercolors of Grounds, done for various assignments in O’Keeffe’s art classes; increasingly abstract paintings of the Blue Ridge Mountains; ink sketches; and even a sculpture. Archival materials – including photographs, books, periodicals and other memorabilia – paint a robust and fascinating picture of the University in the early 1900s. A new self-guided walking tour is also available, taking visitors to the same sites where O’Keeffe once sat with her sketchbook. All of it, according to Matthew McLendon, J. Sanford Miller Family Director at the Fralin, chronicles perhaps the only period in the famous artist’s life that has not been subject to intensive public and scholarly scrutiny. 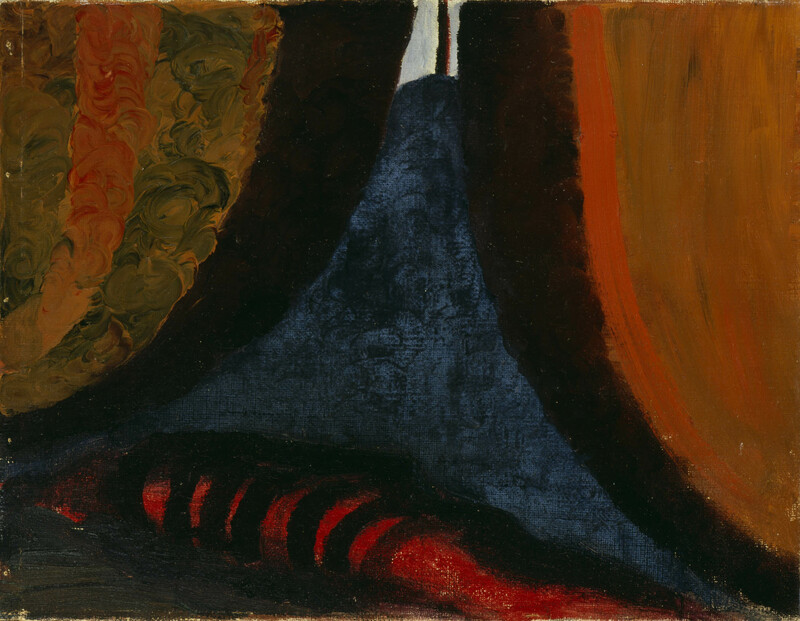 “This is one of, if not the only, understudied period of Georgia O’Keeffe’s history,” said McLendon, who co-curated the exhibition with Elizabeth Turner, a professor of modern art and O’Keeffe expert in UVA’s McIntire Department of Art. 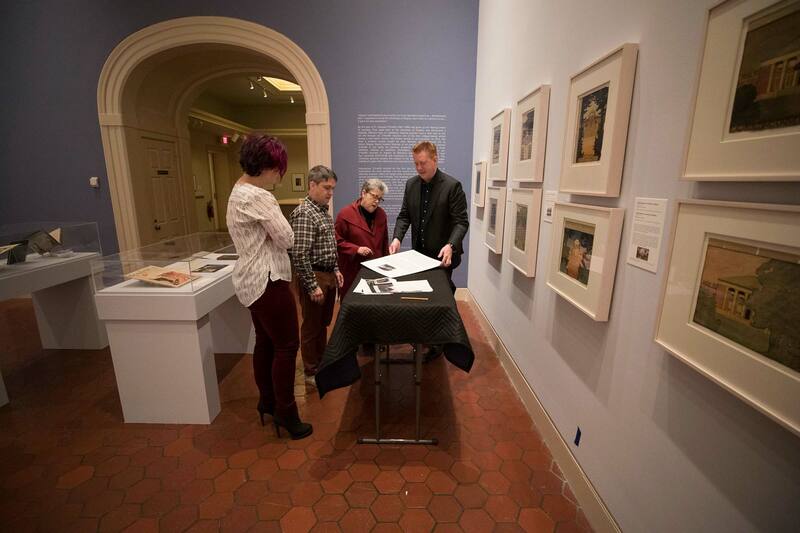 Graduate students, working with McLendon and Turner, have spent months recreating O’Keeffe’s UVA for the new exhibition. When the 25-year-old O’Keeffe arrived in 1912, the University was in the midst of a transformation. The effects of the Rotunda fire of 1895 were still evident, both in the brand-new or newly restored buildings and in the budding landscape, which had only just begun to regenerate. The Rotunda in 1913, as seen from the north, a view O’Keeffe captured several times. Image: Rufus W. Holsinger (American 1866-1930). 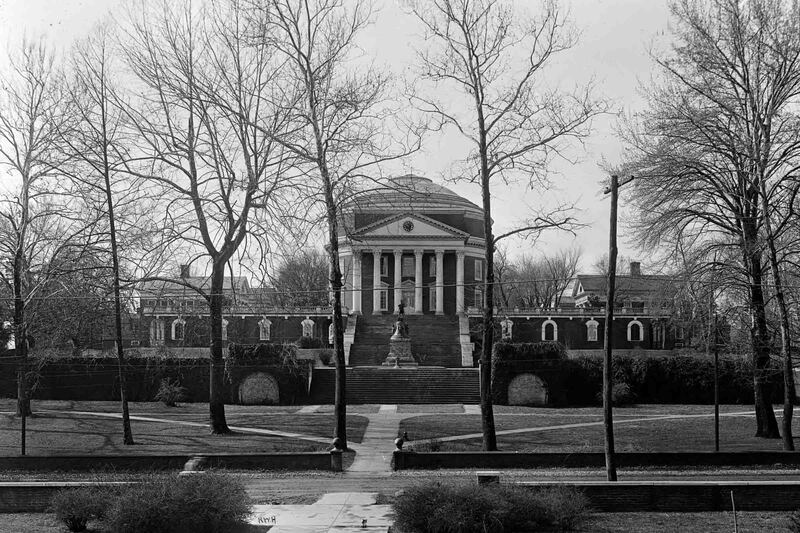 Rotunda, 1913. Dry-plate glass negative. Holsinger Studio Collection, Albert and Shirley Small Special Collections Library, University of Virginia Library. 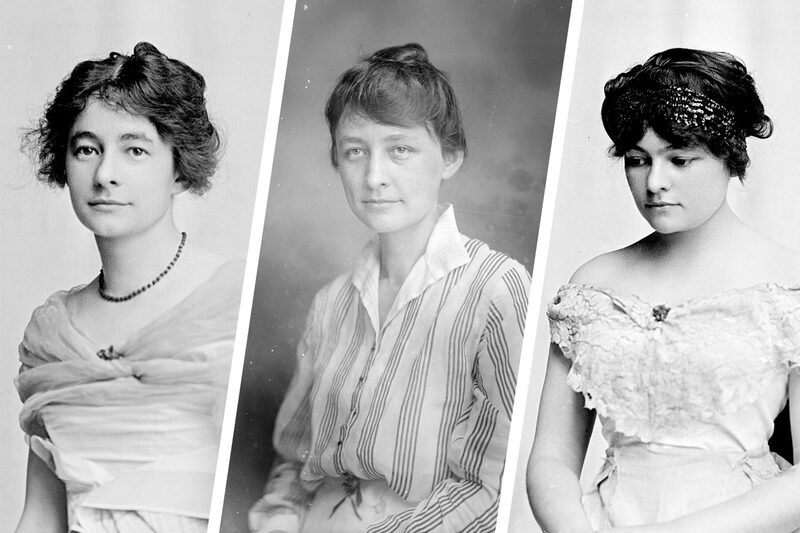 Though women would not be fully admitted for decades, more and more female students were making their way to Grounds through programs like the one O’Keeffe attended, a summer program designed to provide supplementary education for teachers. Almost 2,000 students enrolled in the program each summer, and the vast majority of them were women. O’Keeffe, who worked as an art teacher at colleges in Texas and South Carolina during the academic years, attended the program for consecutive summers from 1912 to 1916, first as a student and then as an instructor. 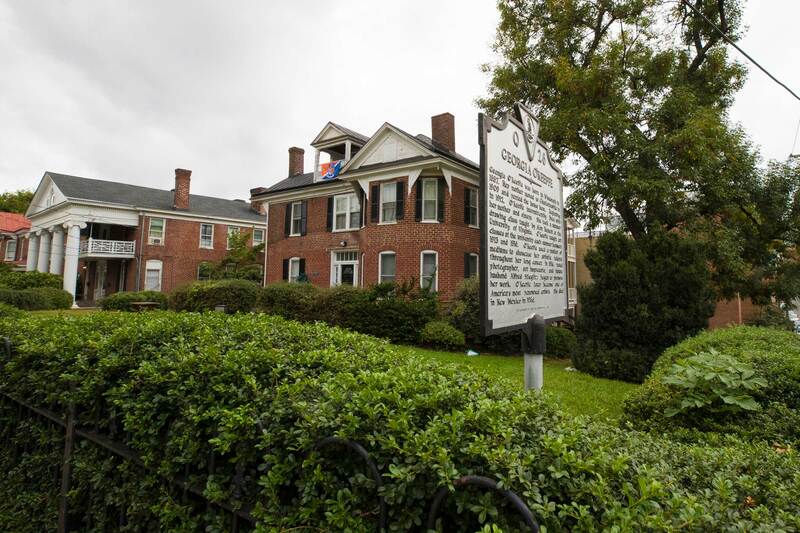 While in Charlottesville, she lived with her mother and two sisters in her mother’s boardinghouse on Wertland Street, a building that still houses students today. Georgia O’Keeffe (American 1887-1986). 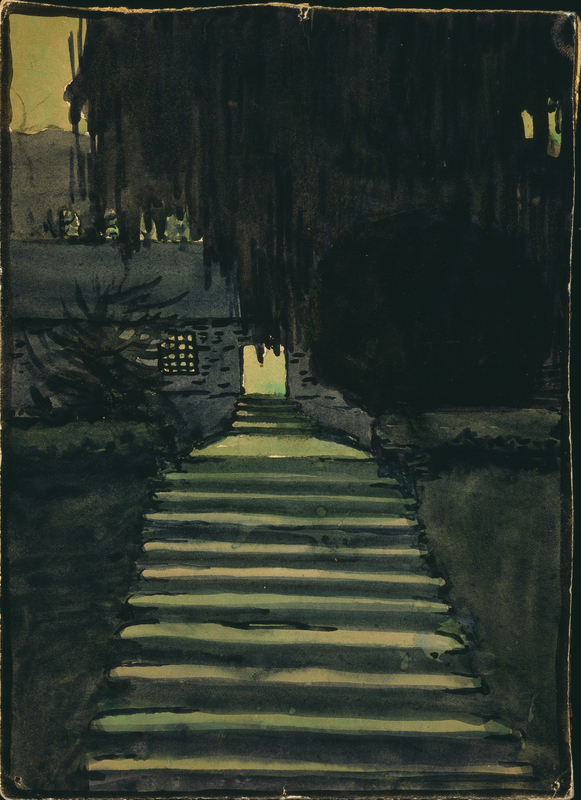 Untitled (West Lawn – University of Virginia), Scrapbook of UVA,1912-1914. Watercolor on paperGeorgia O’Keeffe Museum. Gift of The Georgia O’Keeffe Foundation (2006.05.618). © 2018 Georgia O’Keeffe Museum/Artists Rights Society. Many current students will recognize the pattern of O’Keeffe’s life at UVA, as pieced together by Jonathan Chance, one of Turner’s students, who spent this summer conducting research for the exhibition. Chance, who also works as an assistant winemaker at a local winery, earned his bachelor’s degree from the School of Continuing and Professional Studies in May. “We wanted to figure out who she was, who she knew and what the University looked like then,” he said. O’Keeffe began her day early, attending classes for about two hours in the morning. Like many of today’s students, she walked from her home on Wertland Street, up the Corner and toward the Lawn, via the East Range. This painting, for example, depicts a portion of the East Range, though it was later mislabeled as the West Range. O’Keeffe’s classes were in the building next to Old Cabell Hall, now called Cocke Hall, at the time called the Mechanical Laboratory. It was a relatively new building, built after the fire to house engineering, drafting and drawing classes. 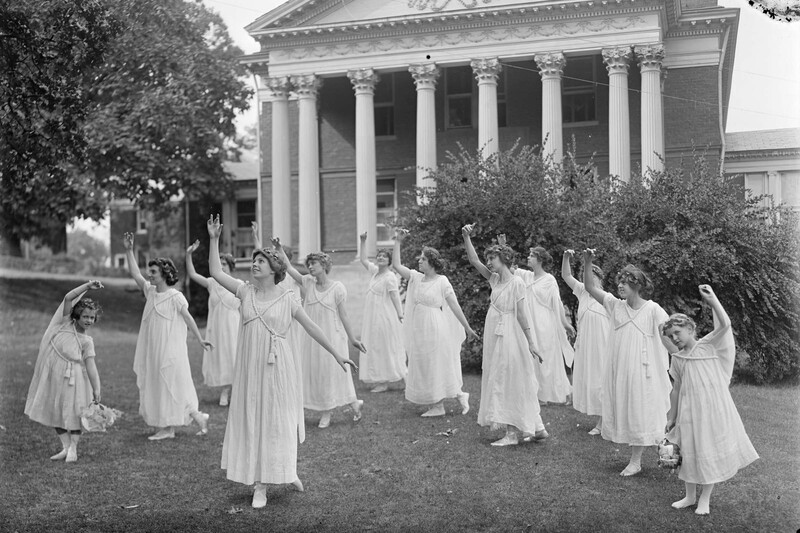 Outside of class, O’Keeffe could have joined fellow students for the summer program’s excursions to Monticello or Natural Bridge, or socialized at dances held in Fayerweather Hall, which was a gymnasium at the time. She sent postcards from the Natural Bridge in August 1916, visiting with friends before she left Charlottesville. Despite sharing in these patterns and activities with her fellow students, O’Keeffe stood out. The boldness and singularity that would characterize the artist – she would become known for her solo trips into the harsh desert landscapes of New Mexico – were already very much in evidence, and she was very well-traveled for someone so young. In the few contemporary photographs we have of O’Keeffe and her sisters, taken by local photographer Rufus Holsinger, Georgia O’Keeffe appears to be a woman who does not hesitate to step outside the norm. Singular though she was, O’Keeffe was far from sure of herself when she arrived on Grounds in 1912. Her mother was suffering from tuberculosis and her family was struggling financially, one reason she was working as a teacher instead of pursuing her own art full-time. She had also grown frustrated with the styles and techniques taught in traditional art lessons, finding them repetitive and uninspiring. That changed when O’Keeffe took her first course at UVA with Alon Bement, a visiting artist who taught in the summer program. 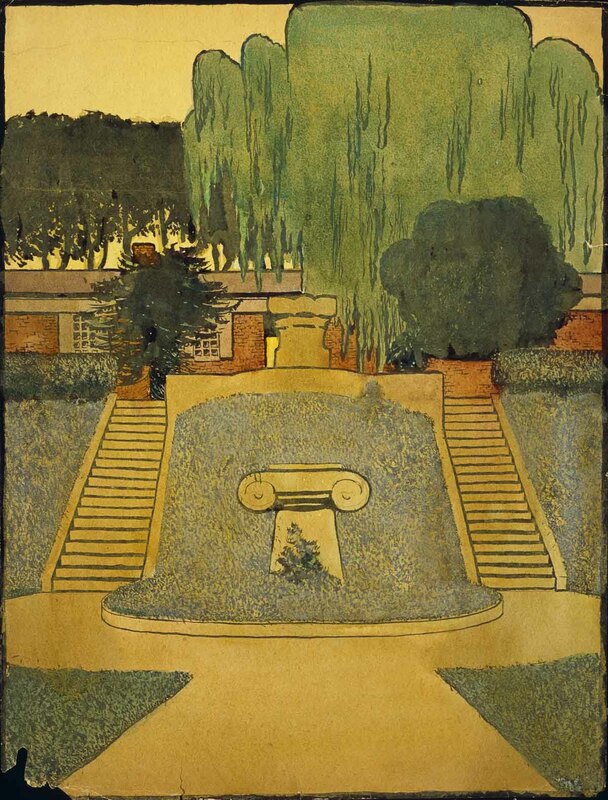 Bement introduced O’Keeffe to the design philosophies of Arthur Wesley Dow, an American artist and educator whose ideas would become the foundation of American modernism. Dow believed that art should not imitate or copy nature, as was the case in the descriptive style taught in most academies at the time. Instead, he argued art should express a scene through design and composition. The artist, he contended, was akin to a designer, creating, inventing and building space instead of painting all of the details exactly as they appeared. O’Keeffe would later move to New York to study under Dow himself, but his ideas immediately start showing up in her student notebooks at UVA, which she filled with watercolors of Grounds like this one, again of the East Range, later mislabeled as West Range. In them, O’Keeffe uses trees and other elements to carefully frame buildings and create symmetry, as seen in her paintings of the gardens and range rooms, or of the Rotunda. The paintings are not designed to replicate the scenes down to the last detail, but rather to provide deliberately designed images of what O’Keeffe sees and feels as she paints on Grounds. For example, Exercise No. 34 from Dow’s book, “Composition,” asked students to create “a landscape, reduced in its main lines, all detail being omitted.” That is exactly what O’Keeffe did in her student watercolors, using symmetrical lines and shapes to lead the eye. The UVA watercolors marked the beginning of O’Keeffe’s journey toward the abstract style that would make her famous, as she increasingly focused on just a few powerful shapes and lines, packing a lot of emotional punch into sparse details. During her last summer at UVA, she took an additional step toward that style in the beautiful Blue Ridge Mountains, where she fled during a time of heartbreaking grief. When O’Keeffe returned for what would be her final summer in Charlottesville in 1916, she was reeling from her mother’s death earlier that year. Her letters from that time were despondent and hinted at depression, as she wrote about not wanting to do anything but sleep and expressed no enthusiasm for her art. O’Keeffe turned to a familiar place and ritual for comfort. She had often visited Elliott Knob, a peak on Great North Mountain near Staunton, with friends. O’Keeffe returned there to camp, and then a week later camped with friends at Humpback Rocks, familiar to UVA students as one of the most popular short hikes near Charlottesville. True to her reputation as a rugged individualist, she slept outside her tent directly on the rocks, under the stars. Uncomfortable as it sounds, the ritual seems to have had its desired effect. O’Keeffe began painting again – colorful watercolors of mountain scenery that are more abstract than most of her work to that point. Georgia O’Keeffe (American 1887-1986). Inside the Tent While at U. of Virginia, 1916. Oil on canvas. Georgia O’Keeffe Museum. Gift of The Georgia O’Keeffe Foundation (2006.05.039). © 2018 Georgia O’Keeffe Museum. The scenes she painted are familiar to any ’Hoo, evoking the undulating mountains that form the backdrop to Grounds itself and have long called to any student wanting to escape to nature for a little while. Like many UVA graduates today, O’Keeffe went from Grounds to New York City, where art dealer and photographer Alfred Stieglitz held an exhibition of her work in 1916, followed by a solo show in 1917. She started studying under Dow himself, who taught at Columbia University Teachers College and married Stieglitz in 1924. Her work grew bolder and more abstract, taking Dow’s philosophies to greater extremes and transforming natural and architectural forms into abstract shapes. She began spending more and more time in New Mexico, finding inspiration in its stark desert landscapes. She moved there permanently after Stieglitz’s death in 1946, and Santa Fe is now home to the Georgia O’Keeffe Museum, established after her death in 1986. Though her work evolved significantly after she left Charlottesville, McLendon, Turner and her students see echoes of her time here even in later works. Chance, for example, found a reference to the arched passageways underneath the Rotunda, a shape that shows up abstractly in O’Keeffe’s work. Meaghan Walsh, a second-year doctoral student studying art history and architecture, noted that O’Keeffe kept her sketchbook from Charlottesville with her until her death. McLendon has found enough to declare the exhibition just the beginning of telling the full story of O’Keeffe’s years in Virginia. He and Turner hope to turn the exhibition into a book project with Turner’s students. He, Turner and the graduate students behind the exhibition hope it plants a flag for O’Keeffe at UVA. Chance put it this way, gesturing to the Rotunda and other nearby buildings and gardens. Turner also sees O’Keeffe’s story as an important reminder of the many other journeys that have and will start here on these Grounds.